Linux has many capabilities far beyond those of Windows. One of those is the use of multiple desktops. This feature of most Linux desktop environments, including Gnome and KDE allows you to have more than one simultaneous working desktop. “Why would I ever need that,” you say? One reason for having multiple desktops is to reduce the clutter on any one desktop. I use multiple desktops when I am working on more than one project at a time with several windows open for each project. A single desktop can get very cluttered when one is working on multiple projects simultaneously so some option is needed to organize the programs, i.e., windows, for each project. Placing the program windows for each project on a separate desktop allows this type of organization. 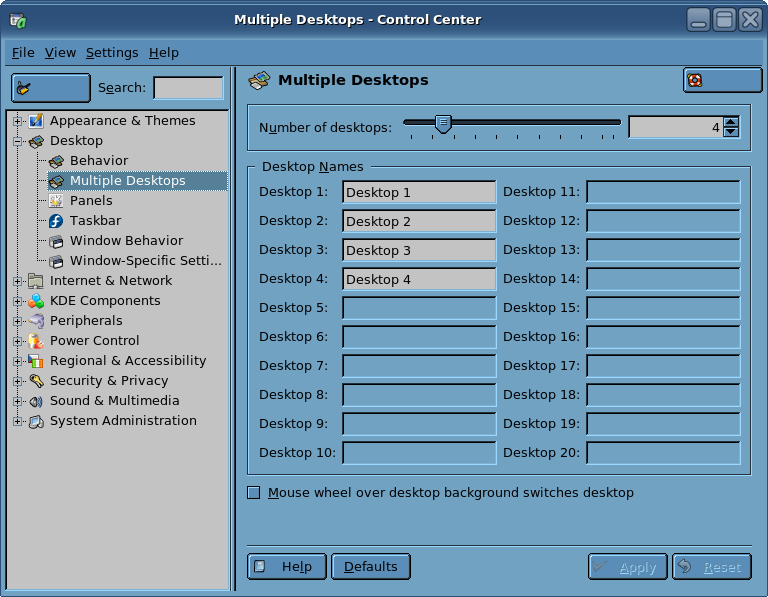 The Multiple Desktops page of the KDE Control Center allows you to determine how many desktops you will have. You can also change the names of your desktops to something meaningful to you. You can switch between projects by clicking on the desired desktop button in the center of the KDE Panel. Setting up multiple desktops is easy. In fact KDE is configured for four desktops by default. You can change the number of desktops from one to twenty. That is a lot of flexibility. To change the number of desktops just move the slider, or click on the Up/Down arrows next to the text box containing the number of desktops, or just type in the number of desktops you want. Then click on the Apply button. Each desktop has a default name but you can change the default names to something which are meaningful to you. Just type the name you want in the appropriate text box and click on the Apply button. The default names, “Desktop 1” through “Desktop 4” are very boring. Click on the desired Desktop Pager button to switch between desktops. I have named my desktops with names meaningful to my way of working. The default names of Desktop 1, etc, are a little bland but just as useful. The figure above shows the Desktop selection buttons on the KDE Panel as I have renamed them. This portion of the KDE Panel is known as the Desktop Pager. 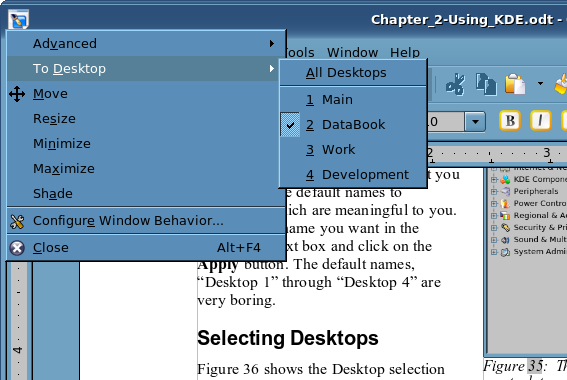 Notice that the “DataBook” button is highlighted as that is the desktop in which I am currently working. To select a different desktop simply click on the desired button. Another useful piece of information is knowing how to start or place a given window on a specific desktop. The easy way is to simply select the desktop first, and then launch the programs you want to use on that desktop. I sometimes open several programs and have multiple windows going before I decide that I really need to place them on a different desktop. It is easy to place an open window on a different desktop by using the Title Bar Menu Icon selecting To Desktop and the name of the desktop to which you want to move the window. Note that you can have multiple copies of the same program each running on different desktops. For example you can have one copy of OpenOffice Writer on one desktop, as I do while writing this chapter, and another instance of OpenOffice Writer on another desktop with a document for your work. Place the window on a different desktop using the Title Bar Menu Icon to open the window Operations Menu. You can also choose All Desktops to have the window appear on all desktops. You might want to do this if you have one program that is especially useful no matter which desktop you are working on. You may want a single instance of your Firefox web browser to be available to you on all desktops for example. Two other methods for getting to the window Operations Menu is to right click anywhere on the Title Bar, or to right click on the button for that window in the Task Bar. The Window Menu pops up and you can choose the To Desktop item and select the desktop to which you want to move the window. As with all other features of Linux and KDE there are many choices and possibilities. You can play with this feature and decide how you like to use it best. Or you do not have to use it at all and you can simply use a single desktop. In that case you may want to configure KDE for only a single desktop. This can save space on the KDE Panel for other buttons and icons.